Chezkiyahu, 12, was one of the first students in Meshi’s fledgling kindergarten, and one of the most severely disabled of all. His progress over the years—an amazing, near-miracle of a breakthrough---is a testament to the extraordinary care, treatment, perseverance and love of the Meshi staff. Chezkiyahu personifies Meshi’s mandate to provide the maximum for every child, regardless of the extent of his or her disabilities, and regardless of the time, effort and expense involved. His physical disabilities are profound: At birth, Chezkiyahu was paralyzed from cerebral palsy, with little or no ability to move his arms, hands, legs, head or mouth. 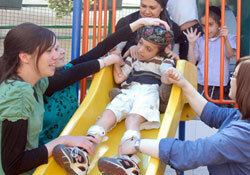 Beyond the paralysis, Chezkiyahu could not speak or communicate, nor could he eat. When he first arrived at Meshi, it was impossible to judge his cognitive level, much less see into the heart and soul of the child trapped within this terribly disabled body. Finding a way to make the most of his physical constraints, to establish communication, and to enable Chezkiyahu to express himself was a long, hugely challenging, tedious, and emotional process. Yet today, Chezkiyahu, often coined a “young Stephen Hawking,” is quite an articulate (via his special talking computer), highly intelligent and spiritual young man. Seven years after he first arrived, he will now be leaving Meshi to study in a regular school. 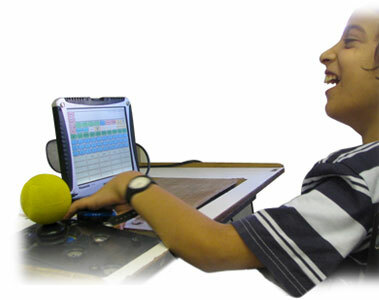 According to Talia, the joystick enables Chezkiyahu to power the wheelchair, manipulate the seat to position himself, and operate a computer. Using the joystick, Chezkiyahu presses a letter, which registers through a virtual keyboard. Through the computer’s specialized audio control, Chezkiyahu types and the computer speaks. By mastering computer skills, this young man is able to prepare his lessons, communicate with his friends, write e-mails, create PowerPoint presentations, and more. Today Chezkiyahu is completely independent in his schoolwork and solves his own problems.